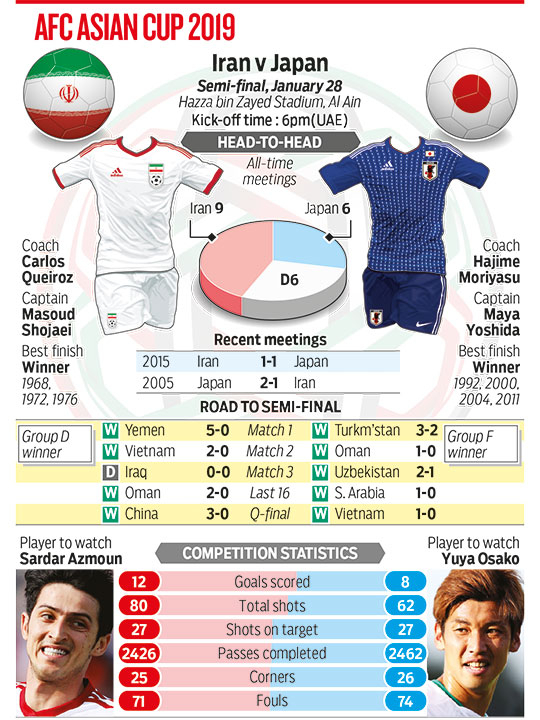 Al Ain: It will all be about who shows more hunger when Iran take on Japan, in Monday’s first semi-final of the 2019 AFC Asian Cup, at Al Ain’s Hazza Bin Zayed Stadium. The winner will secure a berth in the February 1 final, either against hosts UAE or Qatar. Iran have the experience of participating in the last 13 consecutive tournaments, but that counts for little as Carlos Queiroz’s side pine for an elusive fourth title. Iran last won the crown more than four decades ago, following a triple run of back-to-back titles between 1968 and 1976. “We need to believe in ourselves. We need to believe in what we have been doing for so long. There is a consistency and a momentum, and we cannot afford to lose it,” Queiroz told journalists at the prematch conference. “We are up against a strong team like Japan and we need to believe in our plans to win and give ourselves the chance to be in the final for a trophy. We are just 90 minutes away from a final since 1976, and that’s the reality. This match will be settled by a team that shows more hunger and less mistakes,” the Portuguese added. Team Melli feature many of those who performed heroically at the 2018 Fifa World Cup in Russia last summer, including goalkeeper Alireza Beiranvand, Morteza Pouraliganji, Karim Ansarifard, Sardar Azmoun and Alireza Jahanbakhsh among others. Their strikers have been sharp while scoring 12 goals in their five matches, and their defence has been rock solid while not conceding a single goal so far. They will be missing three-goal star Mehdi Taremi, though, who picked up a second yellow card in Iran’s 3-0 quarter-final win against China. However, the team will be pleased with the return of Vahid Amiri after serving out a one-match suspension. The highest ranked team in the competition at No. 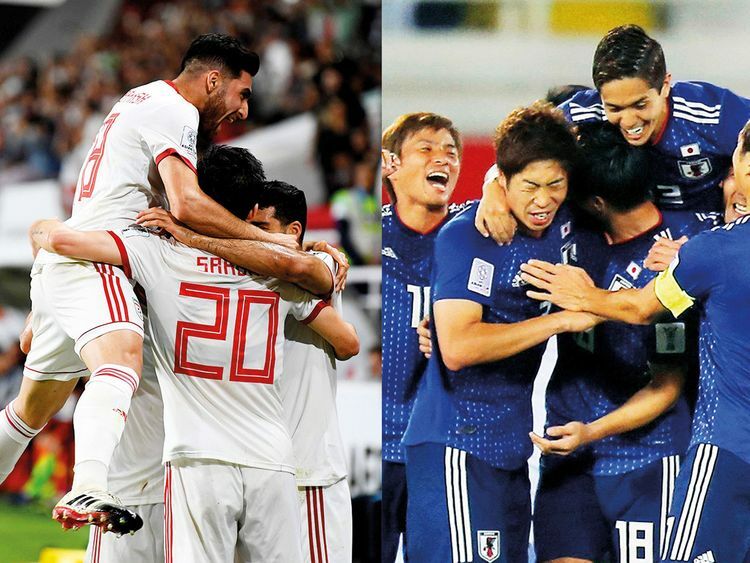 29, over the past 43-odd years, Iran have made five World Cup appearances and won three gold medals at the Asian Games. However, the one trophy that is missing from the cabinet in Tehran is the Asian Cup. “We have everything in our favour at the moment. After five matches, we are yet to concede a goal in this tournament and we hope this holds,” the 65-year-old Portuguese coach said. The Blue Samurai have won the trophy a record four times, though, in 1992, 2000, 2004 and 2011. They have been champions in four of the last seven editions, and three of the current squad were part of the victorious 2011 team. Hajime Moriyasu — who was an assistant to Akira Nishino at the World Cup in Russia where they matched the might of Belgium in that 2-3 loss in Rostov-on-Don — feels the Blue Samurai are a team in transition. Moriyasu has come with a mixture of youth and experience and despite a strong start under his tenure, the 50-year-old refused to be believe his team will be under pressure. “We are not under any sort of pressure,” Moriyasu refuted. “We have been improving as a team, and the results of the past five games have given us a lot of confidence. We have begun to trust ourselves and what we can do in various situations on the field. I am confident this team can deliver and book a place in the final,” he added.